As authorities continue to investigate the gas explosions that rocked Merrimack Valley, people are trying to get the help they desperately need. While most of the families affected by the Boston-area deadly gas explosions in the Merrimack Valley have been given the OK to return home, some remain in shelters that were meant to be temporary. "I'm just happy that I have a roof over my head," Nicole Hodgkins said. "Me and my son were able to get out of Lawrence safe." Arlington Middle School in Lawrence remains open for the families whose homes were destroyed in the tragedy on Thursday. Electricity is back in most households affected by the explosions, but it could take weeks for gas to be restored. Gov. Charlie Baker announced Monday that he and officials from Lawrence, Andover and North Andover are working to set up the Greater Lawrence Disaster Relief Fund to help those affected by the explosions. The hope is to have it up and running by the end of the week. 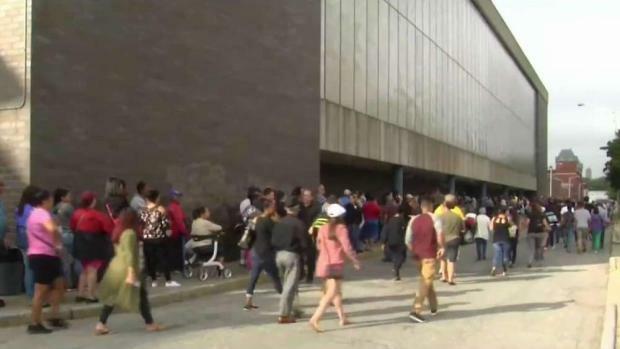 Hundreds of people lined up and waited for hours to file claims with Columbia Gas in Lawrence, Mass. after last week's fires and explosions. "For many people, the gas explosions of the past few days created a whole series of short-term dislocations and calamities," he said. "There are a whole bunch of other things associated with not having gas power that become significant issues for them. For many people, this is going to take a while and this is going to create some real hardships for them." "This isn't a gas problem, this isn't an electricity problem or an infrastructure problem," Lawrence Mayor Daniel Rivera added. "This is a human problem." Baker said the fund will be focused on helping those who need housing, food or other items not directly related to the work Columbia Gas is doing. He said the nonprofit will be situated within the Essex County Community Foundation. Information on the application process is expected to be released in the coming days. 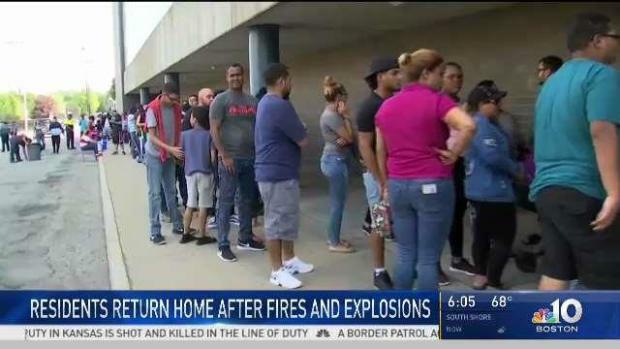 The investigation into what caused the explosions is partially focused on pressure sensors that were connected to a gas line that was being taken out of service shortly before the blasts, the head of the National Transportation Safety Board said Sunday. 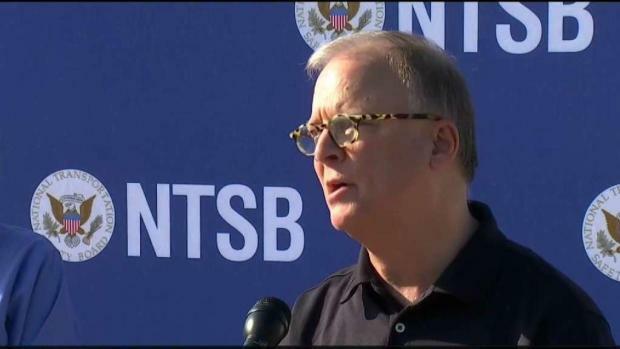 NTSB Chairman Robert Sumwalt said the sensors can signal for gas pressure to be increased if the pressure gets too low. He said investigators will try to determine whether those sensors played any role in Thursday's explosions and fires. "We found evidence from an evidentiary dig ... that pressure sensors were attached to a gas line that was being placed out of service and being capped off on Thursday," Sumwalt said. NTSB officials say an official report revealing the cause of the deadly Merrimack Valley explosions may not be released for up to two years. 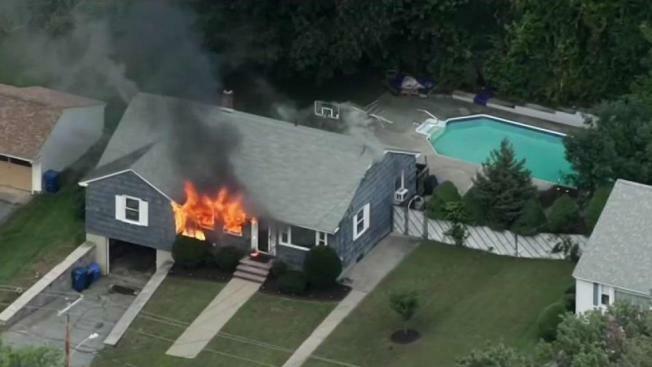 Dozens of homes were destroyed or damaged, a teenager was killed and 25 were injured in the series of gas-fueled explosions and fires in Lawrence, North Andover and Andover. Thousands were forced to leave their homes. "It's evident to me and to all of us that the Merrimack Valley and the residents of our state are being as supportive as they can be and as kind as they can be to one another during this most difficult time," Baker said Sunday. "We still have a very long way to go but we're very happy that people can return to their homes this morning." Schools in Lawrence were closed Friday and Monday because of the gas situation, but are scheduled to reopen Tuesday. Andover and North Andover schools reopened Monday after being closed Friday. Sumwalt said officials will be looking at how local Columbia Gas officials responded to a "pressure increase" in the Lawrence area that was detected at the company's pipeline control center in Columbus, Ohio, prior to the explosions and fires. He said there is no evidence the explosions were intentional. Columbia Gas on Sunday turned away hundreds of Lawrence residents who wanted to make damage claims because it couldn't handle the deluge, The Boston Globe reported. The company told residents, many of whom waited for several hours, to come back Monday. Abbey Niezgoda reports from Lawrence that just because residents are now back home, it doesn't mean they feel safe. "I am tired. I am frustrated," Renata Rena, who waiting in line with her 3-year-old daughter, told the newspaper. "We don't know what's going on, what's gonna happen," Luz Ramos, another woman waiting in line, said. She's been staying in a shelter since the fires. She says she wasn't even able to grab her purse when she evacuated from her home. "I was running with all of my family. No money for many days," she said. She waited in line, hoping to get a gift certificate for food. She got a red ticket, which means she'll have to come back Tuesday. "I feel bad, I just feel bad," Stephanie Pena said. She came to file a claim and got a blue ticket Sunday, which means she'll get to go in Monday and file her claim. She'll be able to speak to an adjuster about what she lost in the loss of power and evacuation. "Whoever is here and waiting... they should get their help. There's a reason why they're here," she said. Pena was given the all clear to go home, but she still feels uneasy about it. "I think I was sleeping with one eye open and the other one closed. I'm like I hope nothing goes on or anything," she said. Those who waited in line on Sunday were given blue tickets to file claims with the company on Monday. Customers were given gift certificates for food. Hundreds more customers who did not receive blue tickets lined up on Monday to file claims with Columbia Gas. Those 750 customers were given red tickets and ordered to return Tuesday. Customers who filed claims were able to report food, medicine, property and work hours. A single person household received a $100 gift card for the week for food while a family of four or under was given $200. Households with more than four family members were given $300. People can file a claim without waiting in line and can opt to do so over the phone or online. However, those who do not file claims in person will not receive gift certificates. Customers can file a claim by calling 1-800-590-5571. Claims can also be filed at 1 Market St. in Lawrence from 9 a.m. to 9 p.m. Tuesday and from 10 a.m. to 8 p.m. Wednesday. Joe Hamrock, chief executive of Columbia Gas' parent company, NiSource, said Sunday that the company is taking full responsibility for what happened and is implementing a service restoration plan. He said the devastation and tragedy caused by the explosions are heartbreaking. "We're in this for the long run," Hamrock said. "We know this has damaged the confidence and trust in our company and what we do. Our full commitment is restoring that trust and that confidence." Officials said gas company technicians will turn all of the meters back on after safety inspections of the entire system are complete - a process expected to take several weeks. They warned residents not to turn the meters back on themselves, not to turn on gas appliances until service is restored, and to call 911 and evacuate their homes if they smell gas. Editor's Note: At one point Monday evening, the Andover Police Department said that a second victim, a resident of that town, had died after the explosions. Minutes later, police said that was a mistake and that a second person had not died.